“Job's Three Questions and their Answers”BY H.L. 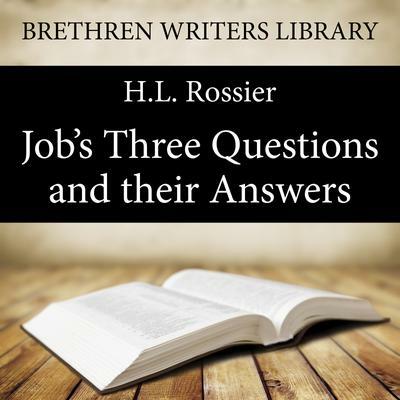 Rossier In the book of Job we find the highest and deepest questions, and some of them elucidated in a way far exceeding any other revelations in the Old Testament. It is marvellous to see how in this book all-important questions that man can put in his seeking for forgiveness, and in his searching out the mysterious ways of God are satisfactorily answered. “Wherefore was I born?” “How can man be just with God?” “If a man die shall he live again?” Publisher’s note: This book is part of the Brethren Writers Library series. These books go forth with the purpose of introducing the listener to the writings of men who were gifted of God as teachers ‘for the perfecting of the saints, for the work of the ministry, for the edifying of the body of Christ’. Many of their writings are freely available online at Stem publishing.com. Words by the Wayside, 2015.